(York, Pa., June 22, 2016) - The contract of York Revolution first baseman Telvin Nash has been purchased by the Chicago White Sox, it was announced on Wednesday by Revolution manager Mark Mason. Nash follows catcher Isaias Tejeda, signed by the Atlanta Braves on Tuesday, as the first two members of the 2016 Revolution to ink deals with Major League clubs do so on consecutive days. Nash departs York with an Atlantic League-leading 15 home runs this season, three more than the next closest pursuant. He also batted .275 with 11 doubles and 28 RBI in 54 games played, and ranked third in the league in total bases (109), second in walks (33), first in extra-base hits (26), and third in slugging percentage (.565). For an encore performance, Nash belted a pair of home runs helping lead the Revolution to a big victory over the Long Island Ducks on Tuesday night. His second multi-homer game of the season gave him a franchise record for most home runs in a first half, ahead of Eric Patterson’s total of 13 in the first half of the 2013 season. York fans were regularly treated by Nash, who saved his best for the friendly confines of PeoplesBank Park, where he was batting .342 with 11 home runs and 21 RBI in just 31 games this season. Nash first arrived in York in June, 2015, and batted .270 with 13 home runs and 30 RBI in 64 games last season. That included a torrid finish, belting eight long balls in the season’s final 16 contests. Nash has blasted 23 home runs in his last 70 games, including 18 home runs in his last 42 games at PeoplesBank Park. He is the second quickest to reach his total of 28 home runs in a Revolution uniform behind only the franchise’s all-time home run leader, Chris Nowak. A native of Griffin, GA, the 25-year-old Nash was originally a third-round draft pick of the Houston Astros in 2009, spending parts of seven seasons in the Astros farm system. The talented athlete was also recruited out of high school to play football and baseball at the University of Miami among other schools. Nash now owns 130 career home runs, and was voted best power hitter in the Astros system by Baseball America in 2011. 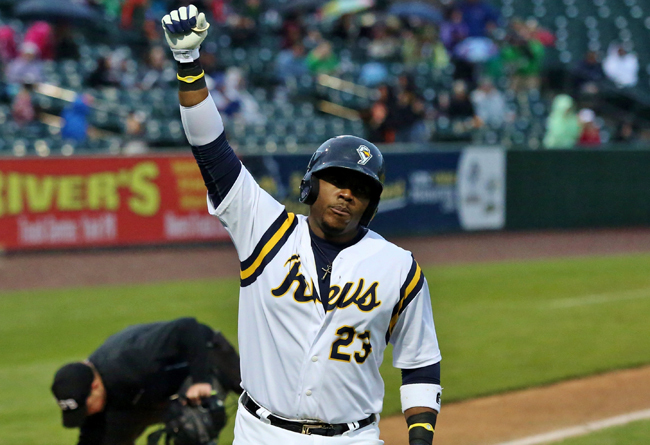 He ranked second in the California League with 29 home runs in 2012 and led the Texas League with 22 long balls in 2014. Nash becomes the 36th player in Revolution history to earn a contract with a Major League organization during the season, and the first to do so with the White Sox. He joins Tejeda as the quickest duo to sign in succession since left-handed pitcher Jesus Sanchez and outfielder Val Majewski both signed with the Oakland Athletics on the same day, May 27, 2010. The only other time two Revs earned Major League contracts in such a timeframe was May 30, 2007, when right-handed pitchers Ryan Baerlocher (Atlanta) and Adam Thomas (Oakland) each signed. Nash has been a catalyst for a power-laden York lineup that leads the Atlantic League with 62 home runs, nine more than any other club. York also leads the league in team slugging (.428) and OPS (.764). The first-place Revs (33-25) enter Wednesday’s homestand finale going for a sweep against the Ducks, leading the Freedom Division by 3.0 games with 12 to play in the season’s first half. The York Revolution Professional Baseball Club is a member of the Atlantic League of Professional Baseball and Atlantic League Champions in 2010 and 2011. Two thousand sixteen will be the Revolution’s 10th anniversary season at 5 Brooks Robinson Way. PeoplesBank Park hosts all 70 home games, in addition to myriad events through the entire calendar year. For tickets or more information, please call 717-801-HITS (4487) or visit the Revolution online at www.YorkRevolution.com. The Atlantic League has been a leader in professional baseball and a gateway to Major League Baseball since 1998. Over 34 million fans have attended Atlantic League games and more than 800 players and 50 managers and coaches have joined MLB organizations directly from the ALPB. The Atlantic League emphasizes winning baseball games, showcasing the talent of top-caliber players and offering affordable family entertainment to metropolitan markets serving nearly 15% of the US population.